Coletta Youngers: One of things we have found in our research is that women in Latin America are incarcerated at an alarming rate for drug policy offences. This started when we were looking at overall statistics, looking at the impact of drug laws on incarceration in Latin America, which show the relationship between those laws and the prison crisis which the region is confronting. Nischa Pieris: And this was a growing population. It became very worrying to us that in some countries up to 80% of the prison population for women are incarcerated for drug crimes. We realised that while they were a numerical minority in the global prison population, they were very, very under-represented in their needs, and why they were being incarcerated was for drug crimes. Coletta Youngers: Then we started looking at, what are those offences? And we found that the vast majority are there for low level offences. They are there because they were selling drugs, small amounts of drugs, or working as what we call human couriers, transporting drugs from one place to another, within a country or over international borders. And then we asked ourselves, well who are these women? And we found the vast majority are single mums. These are women who are facing situations of extreme poverty, very little opportunity for meaningful employment. They are struggling for ways to put food on their table and fulfill their childcare responsibilities. And sadly, engaging in these drug-trafficking activities is a good way to combine the need to earn some income and to also fulfill your childcare responsibilities. I met with one woman in Costa Rica who was formerly incarcerated, who said to me, “I’ve been out of jail now, I have a criminal record, I’ve been out of jail for several months, nobody will even talk to me about employment. But the traffickers who work in my neighbourhood, the drug gangs, they come up to me every day, and say, “if you need help, we’re here for you.” You have to figure out ways that women don’t fall back into these trafficking networks out of sheer necessity, and can really move ahead with their lives. Nischa Pieris: Certainly the issue of women and drug policies is a grave situation not just in the Americas but further afield. 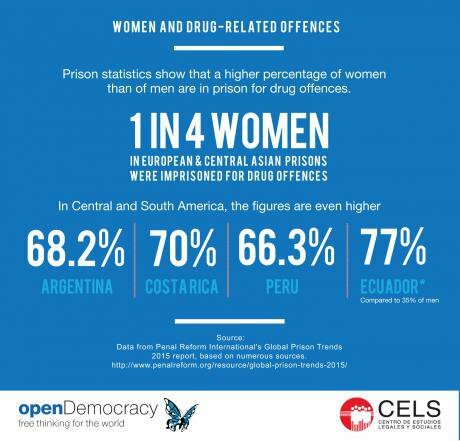 In central Asia, and in Europe we have an issue where most of the countries, about 25% of European and central Asian countries’ female prison populations, the first crime they are incarcerated for is drugs. We looked at Asia where drug laws can be very punitive, and there’s absolutely no drug policy that incorporates a gender perspective. Which means that women are in prison for low-level, nonviolent crimes. Margarette May Macaulay: One of our main interests is the impact that policies have had on certain sectors of the population in Jamaica. In almost all the cities and especially the capital, we have had areas which are ruled, literally ruled, by drug lords, they are called in Jamaica ‘dons’. They are like dictators within their areas. They also act like feudal lords and take possession of young girls, which completely erodes any rights these young women have to a proper life, to a life free from sexual violation. They are violated, some of them pre-puberty, or during puberty or just after. They end up with children which they are ill-equipped to nurture or want, because they are unwanted. They have no voice in the matter. And their parents have no voice in the matter, whether a ‘don’ takes over a girl-child. And then in tandem with those violations, there’s the physical harm because they are punished for any small infraction, what the ‘don’ considers an infraction. And also they are brought into the trade, as active participants, as mules. At almost every stage of the way, it affects their health, because most of them have to ingest these substances, packed in condoms to travel to the market countries. And some of them die as a result, because these things burst in their system. And the majority of them are caught in the criminal justice systems, and they end up being imprisoned in foreign countries. Their family life is fractured and destroyed, their children are abandoned. Nischa Pieris: I think there are countries which are realizing there is absolutely no value in incarcerating women for low-level crimes and that if they were bolstered in their opportunities, they could make a contribution to society, empowered to take care of their children and keep them in school. Coletta Youngers: There are more and more examples of ways in which people are taking an alternative approach. One is a project in the state of New York in the United States called JusticeHome where women who are convicted of felonies, and agree to go into this programme, can actually serve their time at home, engaged in employment, education, and other opportunities. And they’ll be with their children, earning income all at the same time, serving a non-custodial sentence. This video is published as part of an editorial partnership between openDemocracy and CELS, an Argentine human rights organisation with a broad agenda that includes advocating for drug policies respectful of human rights. The partnership coincides with the United Nations General Assembly Special Session (UNGASS) on drugs.